Fight to the Finish!Does your child love all things action-packed?Surprise your little boy or girl with the Sharper Image Remote Control Toy Boxing Battle Robots and watch their eyes light up!High Octane Fun For AnyoneChildren and adults of all ages will have a grand old time controlling the robots with the wireless remote controls while the full motion arms bring endless punches, jabs, and hooks! 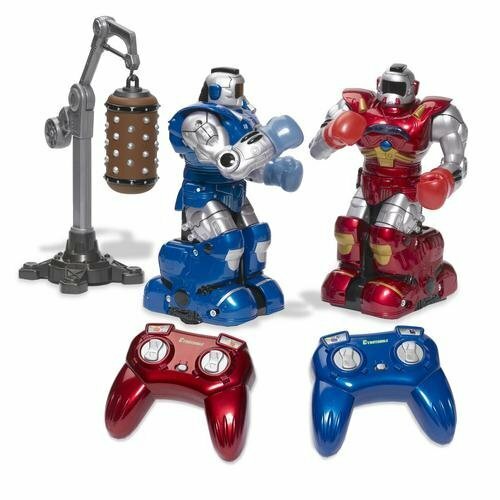 Hit your opponent a few times with the robot's fists and watch their head pop off indicating defeat!An Unforgettable Gift They'll LoveThe Sharper Image Remote Control Toy Boxing Battle Robots make an exciting and engaging present that's wonderful for birthdays or a special occasion!Features: Full Motion Arms Radio Controlled Wireless Technology Multi-Directional Nested Wheels Pop-Off Robot Head Action Battery Operated (Batteries Not Included)Package Includes: Two Boxing Battle Robots (Blue/Red) Two Dual Control Wireless Remote Controls What Are You Waiting For? Buy it Today and Knock their Socks Off! Click "Add to Cart" NOW! 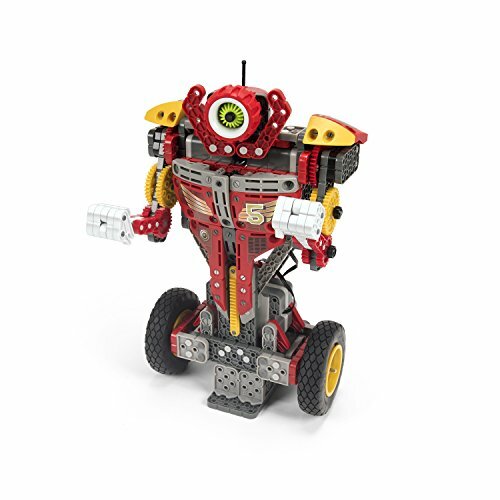 Step into the ring and immerse yourself in STEM action, assembling the VEX Boxing Bot By HEXBUG. Made from snap-together pieces, this "smart-tech" self-stabilizing fighter is ready to throw down. Using the VEX Pilot App., control your robot's every action. Deliver swift uppercuts or jabs to the enemy, all while monitoring your robot's health on your phone screen. Warm-up on a mock rocker bot, master your skills, and become the champion! VEX Robotics Boxing Bot Single by HEXBUG is compliant with CPSIA standards. Duke it out against your friend with this pair of motion-controlled boxing fighters. 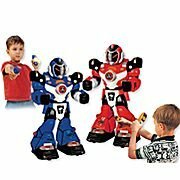 infrared remote control fighters with full-function action LEDs on chests count direct hits realistic hooks, jabs, crosses and uppercuts 5 facial expressions Ages 5 and up. Uses 8 type "AA" and 8 type "AAA" batteries, not included. Each measures 12"H.
These Glow-in-the-Dark Robo Smashers are rarin' to duke it out in the Ultimate Robot Championship. Pick Hi-Tek or Beast, pick a corner and use your controller to lead your guy to victory. When your robo hits his opponent's head sensor 3 times, you win. Or go for the ultimate victory and help your guy smash his opponent out of the ring! Lights and sounds deliver a revved-up experience. A great way to develop hand/eye coordination, this game is designed for ages 3+. Includes a battle arena, 2 robot fighters and 2 infrared controllers. Arena is 17in.L x 10in.W x 4in.H. Requires 10 AAA batteries (not included). 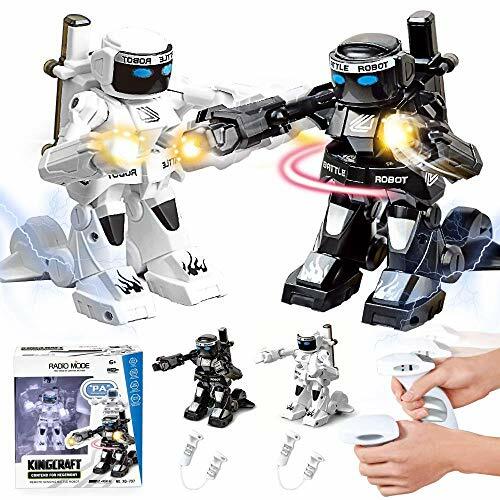 Two fighters, mano-a-mano, face off as you control the action with a wireless infrared remote control, allowing them to move realistically. The touch pad controls eight directional movements, including forward, backwards, right and left turns, and even 360 degree spins! In Battle Mode, the two fighters engage in a fierce combat. Attack with dazzling combinations, of left and right hooks, jabs and straight-ahead punches. You'll learn to defend just like a professional boxer. Lights in the gloves turn bright when a hit is scored. These fighters participate in a follow-the-lights sparring session, too. 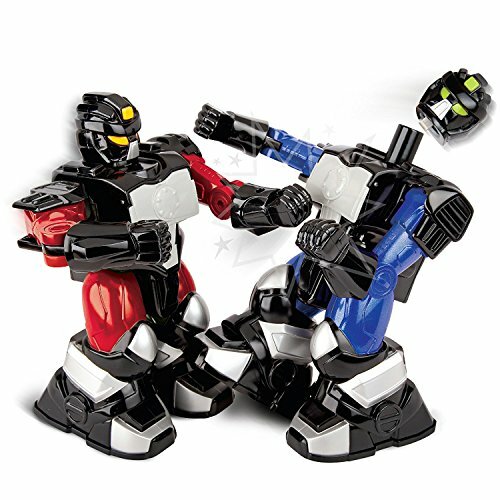 Looking for more Boxing Fighter Robots Toy similar ideas? Try to explore these searches: Multi Pack Die Cut, Foam Trucker Hat Cap, and Backstage Beauty Collection. 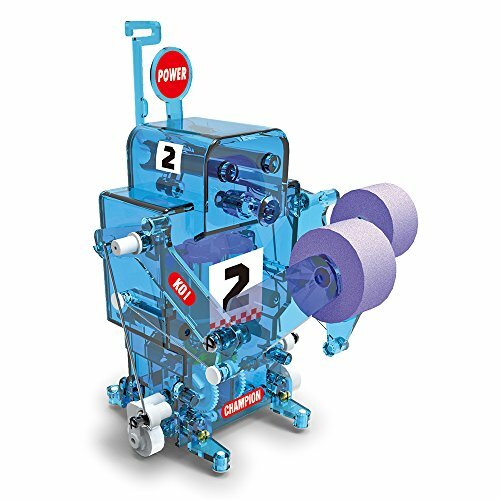 Look at latest related video about Boxing Fighter Robots Toy. Shopwizion.com is the smartest way for online shopping: compare prices of leading online shops for best deals around the web. 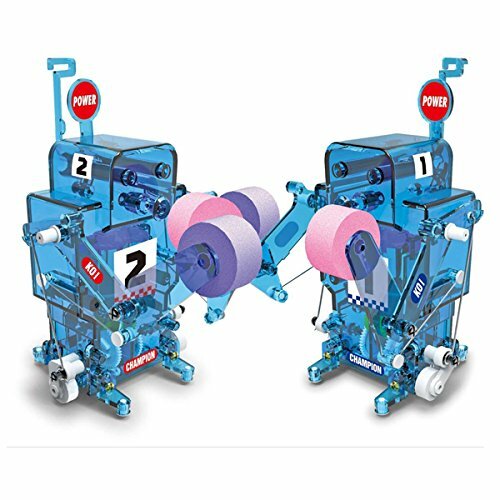 Don't miss TOP Boxing Fighter Robots Toy deals, updated daily.